Clayton Webb is in the process of getting his commercial helicopter pilot license. April is here and we’ve been blessed with some good moisture this spring. Things are greening up and we are getting busy. We worked our first set of calves on one of our herds of momma cows the other day and will continue working them a herd at a time in hopes of finishing up by the end of the month. This is the first time they have been worked since being born. We brand and vaccinate them for several diseases, de-horn any that might have horns, castrate the bull calves, and deworm and start fly control on them in the form of ear tags treated with a fly killer. When we wean them in several months, we will re-vaccinate them and deworm them again. We have also been getting our hay equipment ready to go. We’ll start laying down wheat for hay in a few weeks so we’ll want our swather, rake, and balers in top condition. With the rains we’ve received, it looks like we will have a good hay crop. The past two years of extreme drought have kept our hay supply on the low side. Our biggest priority this spring and summer will be building up an ample supply of hay for the coming winter and trying to put up enough hay to establish a good carryover into the next year. We began fertilizing and applying weed killer to our Bermuda grass pastures, and we’ll apply weed and brush control chemicals on our native grass pastures in a few weeks. Clayton uses a helicopter to check the farm from the air. Clayton passed his test in March and now has his private helicopter license. He is pursuing a commercial license and hopes to get it accomplished in the next few months. Having a helicopter in our farming and ranching operation has proven quite beneficial. He regularly checks pastures, cattle, and fences from the air, greatly reducing the hours spent on those jobs. He has also been scouting our wheat fields for any problems they might incur. He has put in a good bit of time cutting and stacking cedars in pastures this spring too. Some has been custom work for other land owners and some in our own pastures. The cedars are quite a problem and will take over a pasture without a good management program. Not only do cedars rob the pasture of precious ground water, but they are also an extreme fire hazard in the heat of the summer as well as in the dry of winter. Baseball season is winding down, and son Wade is anxious to start back on the farm. Wade is winding down his baseball season. He really enjoys playing. He pitches, catches, and plays second base. His team is in a tournament at Ringwood this week. He is anxious for school to wrap up so he can start working. He has spearheaded a lot of spring cleaning work around the farm. It is always nice to get things back to a clean and organized state. I have made two profound decisions this week: #1 Stay-at-home moms don’t get paid near enough and #2 We got a lot of hay! Amy’s grandmother passed away this past week and although it was expected, it hit right in the middle of my hay time crunch time. So Amy and Trale’ headed to the northeast while I stayed to tackle the first hay crop and handle our older two children. I found myself busier than a bee! We had planted wheat into our alfalfa stand in the fall. Because of the drought conditions we weren’t sure what could happen and did God ever provide outside our expectations; in fact we considered cutting the wheat for harvest instead of for hay. Late last week, we started mowing down our 250 acres of alfalfa that withstood last year’s conditions. Normally, that would take us a short three days, but this year it took us about 6 days. We typically drive the Hesston 8450 swather about 6 miles per hour but this year we slowed her down to between 1-4 miles per hour. Then we get it dried out and ready to bale. To bale alfalfa in southwest Oklahoma, the humidity needs to be just right or you will have hot hay and something can potentially catch fire but if it’s too dry, it will fall apart. That being said, it’s just part of the farmers’ life to always follow the weather and when it’s right, it’s right. Usually this time of the year the humidity gets right from 10 am – noon and typically from 7-9. Every day is different and as hotter days roll on you will see more farmers sleeping in pickups beside a hay field waiting for the humidity to roll right usually around 2 am. 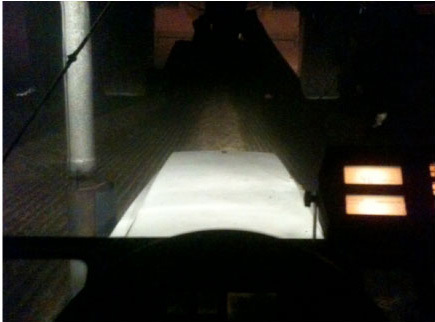 The view from my tractor cab while baling hay late into the night. Reminds me of a story; One summer night I was heading to the hay fields driving around checking which ones would be ready first and swerved over to shine my lights in the field. Low and behold a sheriff’s car was up on the highway and decided I needed a sobriety test. I believe he received the education that night! He didn’t bother me again the rest of the summer.